With drums, songs, rap, performance and a lot of leafleting, the friends of Mumia in Mexico demanded his freedom in the zocalo on Saturday, Dec. 6, in solidarity with the march in Philadelphia. There were also actions and events, starting that day, in San Francisco, New York, San Diego, Baltimore, Portland, Detroit, Cleveland, Missoula, Buffalo, Caracas, Barcelona, Berlin, Paris, St. Denis, Marseilles, Bern, Monterrey and San Cristobal de las Casas. “My brothers and sisters, onaMOVE! I want you to know that the battle continues. It goes on because it must and it’s the right thing to do. As you’ve seen, the law is but politics by other means, and the judges but politicians in judges’ robes. It doesn’t matter what the cases say. It doesn’t matter what the so-called rules say. They’ve never followed them from Day One. On Monday, Dec. 8, the Autonomous Magonista Collective (CAMA) organized a night of film and discussion about the Black Panthers and MOVE to give a context for Mumia’s incrimination. On Tuesday, Dec. 9, 27 years after Mumia’s arrest, we held a rally outside the U.S. Embassy. Among us were comrades who have paid high prices for their resistance, along with a lot of young, energetic anarchists who are barely beginning to fight. 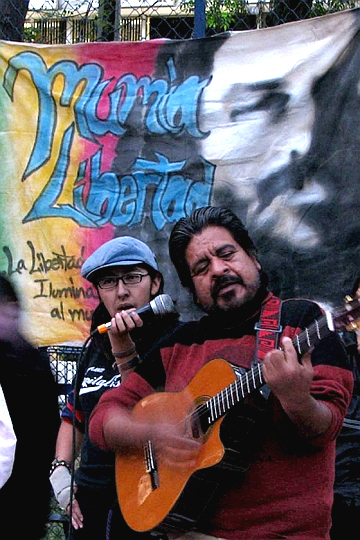 Mexican political prisoners Jacobo Silva Nogales and Gloria Arenas sent solidarity messages (in English or Spanish) showing their identification with Mumia in the goals of the struggle and their understanding of what it means to spend 27 years in prison. 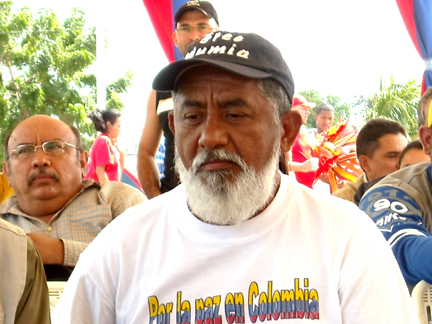 Elizabeth Silva, Jacobo’s sister, who visits him every week in the maximum security Altiplano prison (formerly Almoloya) despite all the mistreatment and humiliation designed to keep family members away, summed up a long letter written by Jacobo to Mumia and spoke of the cruel conditions in Altiplano. 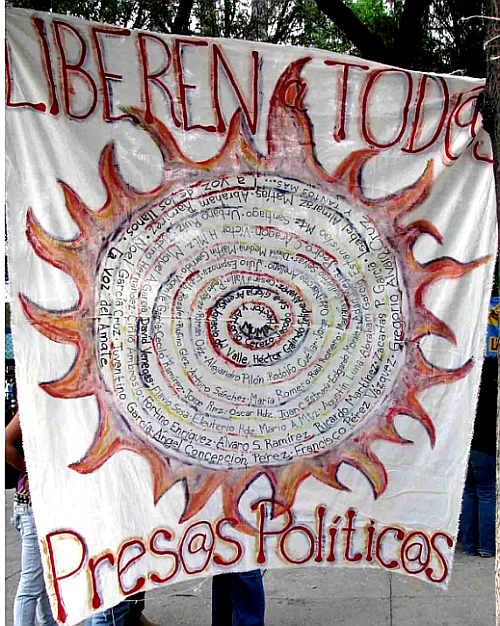 There was a common theme between Mumia’s life and those of former and current Mexican political prisoners who participated in the rally: In spite of all the physical and psychological torture used to break their spirit and will and suffocate resistance, they are unrepentant for having struggled and have been able to heal themselves and keep on going with force, commitment and vitality. The police almost killed Mumia the night Daniel Faulker was shot to death. The state is still trying to kill him, quickly or slowly. The deadly D.A. from Philadelphia, Lynne Abraham, is now petitioning the federal Supreme Court to execute him without so much as a hearing, but Mumia Abu-Jamal keeps on struggling from his cell on death row, with words as his weapon. The police almost killed Jorge Salinas in Atenco, but last Saturday and last Tuesday he was with us, singing Zapatista corridos and songs to Che Guevara and Puerto Rican freedom fighters, holding his guitar in arms once paralyzed and playing with hands once fractured in Atenco. Mumia endures torture every day of his life, in each and every body search, each and every visit where he can’t hold or even touch his loved ones, yet every person who visits him finds him with a smile on his face, a free spirit eager to know how people are doing, how the struggle’s doing and what’s happening in different places in the world. Three women who were with us at the rally – Mariana, Edith and Norma – were raped at Atenco but have the courage to speak of their sexual torture and denounce it publicly. You can tell by their smiles, their voices and the way they walk that, far from feeling humiliated or defeated, they’re stronger than ever. They’ll go anywhere, to any city, any country, to denounce the crimes of their torturers and get them indicted in international courts. If the state can’t execute Mumia Abu-Jamal, it intends to keep him caged for the rest of his life. It doesn’t have the slightest intention of letting him out alive. And the state doesn’t intend to let Ignacio del Valle, Felipe Álvarez and Héctor Galindo out of their cages either. On Tuesday, Ignacio’s son, César del Valle, was with us in solidarity with Mumia, also speaking of his father, the other Atenco prisoners in Altiplano and Molino de Flores (read their greetings in English or Spanish), and those who are hunted by the state and have not been able to return home since May of 2006. César read Ignacio’s powerful message, “Never Surrender,” a message emphasized in lines sent to us by the MOVE 9 political prisoner, Phil África (in English or Spanish). Several people at the rally had also marched in support of Mumia to the embassy in ‘99 and some went to jail because of it. They still admire him and see the relevance of his freedom to that of the political prisoners of Mexico. The freedom songs and poetry of Vicky and Carlos lifted our spirits, and Performákrata dramatized our struggle to free all political prisoners. 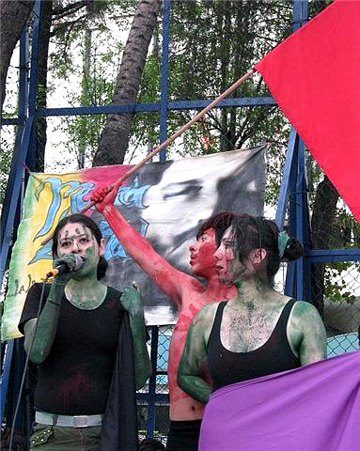 Eugenia Gutiérrez of Women and the Sixth of the Zapatista Other Campaign read an open letter to Mumia (in English or Spanish), speaking of the death penalty as a form of torture and of plans to reinstate it in Mexico. 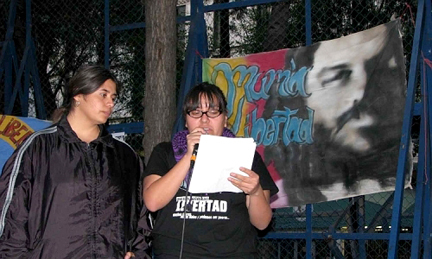 She insisted, “We were born to live and be free.” Compañera Fili from the Santo Domingo neighborhood spoke about Mumia’s presence here in Mexico, and members of the Anarquist Federation, Radiokupa, CAMA, Anarchist Black Cross, Chanti Ollin and CCH Oriente read Mumia’s commentaries and abolitionist and solidarity messages for him. There were also denunciations against the repression in Tiripetío and Oaxaca and against the sentences of the Oct. 2 prisoners. There was a brief blockade on Reforma Avenue and some stayed on the street divider for quite a while with red and black flags, leafleting and chanting. On Saturday night, Dec. 13, we closed the week with a concert-dance, with the announced groups Al Intifadah, Natty Dread Fyah Attack, Zona Norte Colektivo, Santocho Antifa and Radiokupa, plus several other musicians who showed up to play, including Tiempo y Azeta, el Poeta, Vicky and Carlos, Tambores Rumberos, hip hop sound-maker Carlos, and Machetearte performance troupe, who sang out and energized us to gain freedom for Mumia Abu-Jamal and all political prisoners. This story and photos were previously posted at Philly IMC (Philadelphia Independent Media Center). Read “Free the Atenco 13!” by Mumia Abu-Jamal. “Receive from us our spiritual love and our spiritual strength for all of you fighting for the struggle. We have decided to go the American embassy in Caracas to hand to the ambassador a letter to the governor of Pennsylvania, demanding that he immediately liberate Mumia Abu-Jamal. “We believe that the next U.S. president should follow the example of President Chavez, who has liberated over 130 members of the paramilitary who came from Colombia and were captured in Caracas, many of whom were involved in the coup to overthrow the Chavez government. The people with less or no proof of innocence have been liberated in Venezuela. Why then not in the United States for our brother Mumia? And because of the people in the United States who are fighting for the struggle, we know that Mumia shall be free soon. “On behalf of the farmers, of all the campesinos of Venezuela, on behalf of all the brothers and sisters of Venezuela, we know we shall win alongside of you. Contact Hans Bennett, co-founder of Journalists for Mumia, at destroycapitalism@hotmail.com and visit www.Abu-Jamal-News.com. Next articleFree the Atenco 13!